I’ve been in Cyprus for three weeks now, meeting with officials, professionals, and activists about the peace process, their bicommunal work here, and my theoretical thesis project. I’ve been immersed in peace talks, and have met with incredibly hardworking and passionate people. Still, the environment does not speak peace, and it has been weighing on me greatly. But I’ve been in those situations before, and not felt this level of melancholy. This melancholy cuts to my very core, my being. It’s because I am surrounded by the constant reminder of war. The level of urban decay in the old city, the barricade walls of concrete and barbed wire or barrels and sandbags, the passport checkpoints I have to pass to do my work. The reminder that once there were no passport check points accessible to me. The military zone doors opening and the glimpse of a solider and his automatic weapon. The reminder that only 15 years ago, they were stationed on street corners and convoys filled with soldiers were a regular sighting on the roads. “Commando” written on the side of a mountain facing the Greek side. Greek flags and Turkish flags facing each other, 20 meters apart, taunting one another. UN flags and patrols reminding me that the buffer zone is not my space. It is no one’s space. Signs posted around the buffer zone forbidding photography. Today I went to the Home for Cooperation, which is located in the buffer zone by the Ledra Palace. 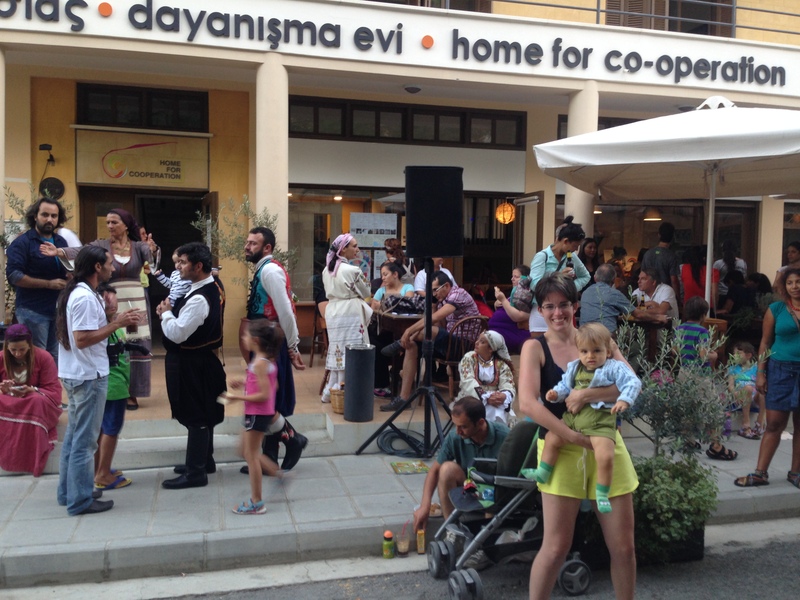 It opened in 2011 and is the first shared space for Cypriots to engage with one another through community activities, educational activities, and outreach. The Ledra Palace acted as a meeting space, but under UN control and requiring one to pass security checkpoints. This is a community space. They hosted a celebration for World Peace Day and the place was filled with people. All ages and many nationalities filled the cafe, outdoor seating, and the road in front of the building. 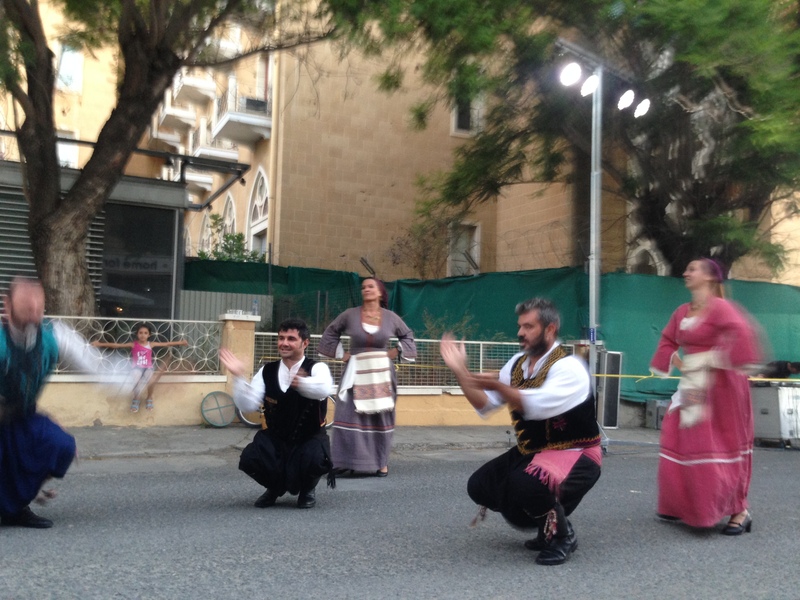 They had folk dancers performing to traditional folk music, music sung in both Greek and Turkish. I recognized a couple of the songs and clapped along while my son wiggled to the beat. My husband remarked how wonderful it is that our son gets to see this. They had a bicommunal choir sing songs in English, Turkish, and Greek. Members read poetry before songs, hearkening to our shared heritage and community. They sang “Imagine” and I sang along to my son. Midway through, I noticed the entire audience was singing along. Hope is an interesting thing. It is incredibly dangerous to repressive regimes. Hope topples dictators. It is the cure to despair. Those who kill themselves do so because they feel, for whatever reason, that there is no hope. All you need is the most infinitesimally small spark to ignite the flame within. Hope released something in me tonight.